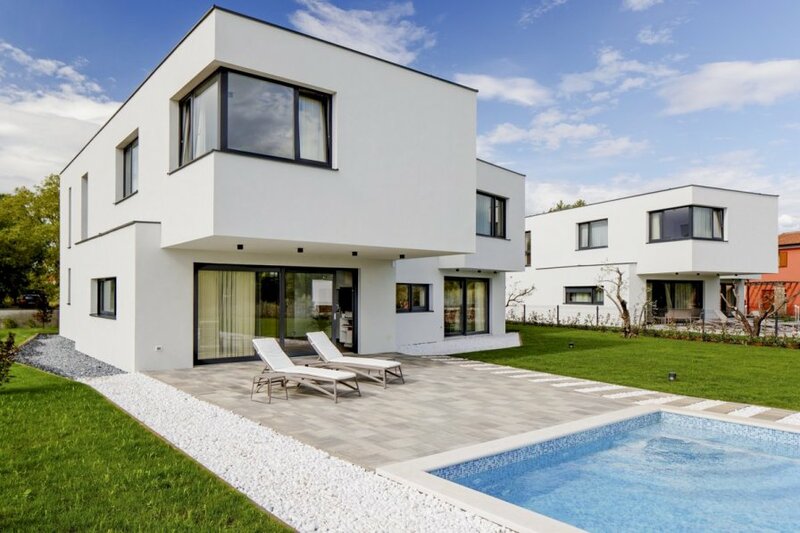 This modern four-bedroom villa, was built in 2017. Perfect for a family or friends holiday as it is situated less than 2km from the historic old fishing port of Novigrad, Istria. The villa is situated over two floors, which are light and airy with large windows allowing the Croatian sunshine to flood in. On the ground floor you will find a modern, well-equipped open plan kitchen area with oven, microwave and dishwasher set around a central island. This is the perfect location for cooking family meals together in the evenings, or simply for a friendly get together. The spacious indoor dining area provides seating for eight people. Patio doors lead from the dining area to the outside terrace and garden where there is also the possibility to dine al fresco in the shade, should you so wish. Downstairs there is also a comfortable seating area furnished with a large flat screen television. Here you'll find large patio doors leading to the outside area, so it's easy to keep an eye on the children whilst they play in the pool. The villa is located just under 2km from Novigrad, originally Cittanova, an ancient Roman fishing village that has in recent years become a well-known destination on the Istrian coastline. In this sweat little village, you'll fishermen who still make their own fishing nets and supply the local restaurants with freshly caught produce.